Outdoor surfaces such as patios and walkways can be much more than just a solid surface to walk on. The selection of pavement patterns, textures and colors has a big influence on the character of these spaces. In Minnesota, we have a seasonal cycle that requires proper material selection and installation practices to withstand the conditions. Function is a key component in designing a patio. How do you see yourself using this space? Weekend gatherings of neighbors for grilling? A quiet space for morning coffee? Let us help you maximize the potential of your patio by designing and building a paver patio that fits your lifestyle and, most importantly, is built to last. We are proud to be an ICPI Certified Paver Installer. 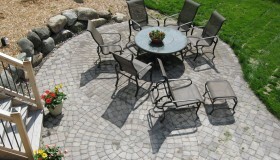 Curbside Landscape & Irrigation is your trusted Minneapolis paver patio expert.